Latest entry in Koei Tecmo strategy series out December in Japan. Following its announcement this morning, Koei Tecmo has released the first details and screenshots of Romance of the Kingdoms 13, due out for PlayStation 4, PlayStation 3, and PC on December 10 in Japan. Unlike previous entries, players will now be able to step into the role of a military commander. And the commanders that appear in the game will have more personality than ever before, with the game unfolding differently depending on how you bond with them. There’s also a “Eiketsuden Mode” (Legend of a Brave Hero Mode). 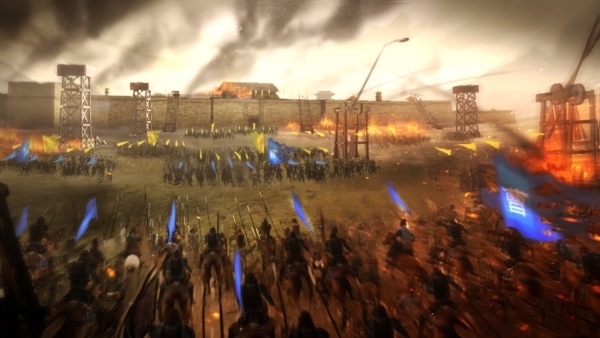 In addition to the field battles featured in previous entries, Romance of the Three Kingdoms 13 adds aquatic warfare and sieges. Stratagems like fire plans have also been added. Similar to previous entries, the continent of China is depicted in 3D on a single map. You’ll be able to seamlessly zoom-in and zoom-out of the map from the overhead view up until inside the city.